TASIS pioneered the concept of Academic Travel in 1956, and the School's students and teachers have been exploring Europe together ever since. Once each semester, all Middle School and High School students take a break from their traditional classroom setting to enjoy week-long trips related to courses of study, particular interests, or grade levels. 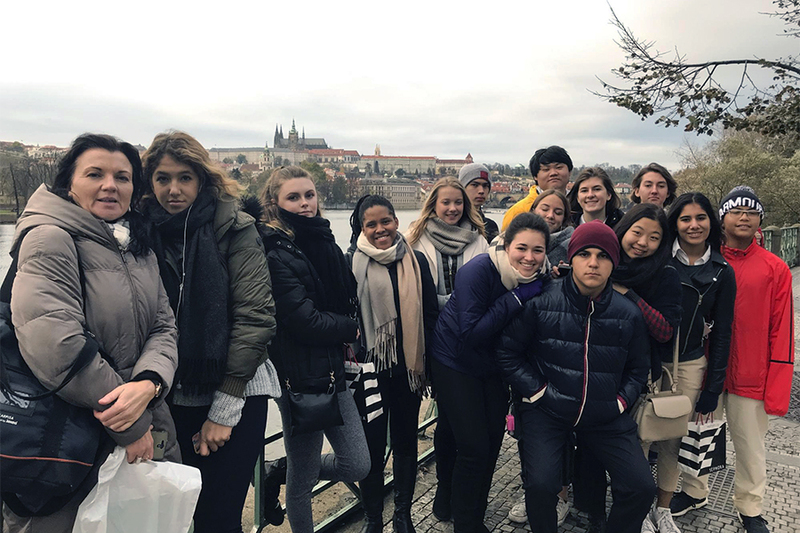 In the following article, Esma Karuv '19 offers a closer look at this fall's Music Appreciation trip to Prague, Czech Republic. This trip to Prague was planned for those who are in love with music and who are interested in the history of the art of music. Our group was selectively picked based on our former involvement with music before TASIS and our present participation in the current TASIS music programs. We were blended together into a group as complete opposites who share one similar characteristic: a great appreciation for music. In our individual passion for music, we all are divergent—our tastes ranged from electronic music composition and Djing to the classical form of music: violin, viola cello, flute, and clarinet. The trip gave us the opportunity to pursue a newfound passion for different music styles we usually do not observe, and those who did not play any musical instrument had a lengthy history of musical theater, choir, and/or singing lessons. Since we are accustomed to Academic Travel trips, we all expected museum tours, and to our delight our museum tours were replaced with highly esteemed music productions. The first thing we did on our trip was to leave TASIS at 5:30 AM, which was not exactly the most anticipated part of the trip. All in all, the journey to Prague was quick and easy. Upon our arrival, the drive from the airport to the hotel was long, which gave us the chance to examine the kind of city Prague is. I was in awe at the sites of Prague and the similar yet unfamiliar architecture and land. Prague had a mixture of all the major cities I have visited before. At times I thought I was in London, then Paris, then Belgium, then Zurich...Prague is its own city that has a uniqueness of resembling many major cities combined together. The difference of Prague does not come on strong—it gradually introduces its new and unknown self. Prague is distinctive because it carries an aura that is not present anywhere else. When I was there, I did not feel the difference of being somewhere new; the feeling of being there was strange, almost as if I was somewhere else. We welcomed Prague as a city that provided food, music, and life. Every day through the week we experienced different genres of music played in the most beautiful venues. We saw a classical orchestra show played in the Spanish Synagogue, the Romeo and Juliet ballet, the Carmen opera, jazz with dinner, and street music. Each performance we attended was incredible and innovative. We saw the ballet as a classic form of dancing, but the addition of the lights and the stage was modernized so that it implemented both modern and historical styles collectively. The orchestra in the Spanish Synagogue was my favorite performance. The musicians played acclaimed pieces and played them as if there was no audience. You could see the musicians laughing and winking at each other while they played. These interactions made it seem as if we the audience were not present, and they were performing for themselves alone, as if having an audience would not change or affect their performance in any way. The venue itself was stunning: every part of the synagogue was painted with the most intricate details. No matter where the eyes looked, you saw something beautiful with the accompaniment of the sensational music and the obvious presence of the trumpet, which made a strong impression on us all. The city came off as small and adventurous. The options of food and places to see were endless. Every chance of free time was boosted off with half an hour inside Starbucks, no matter where we were (Old Royal Palace). 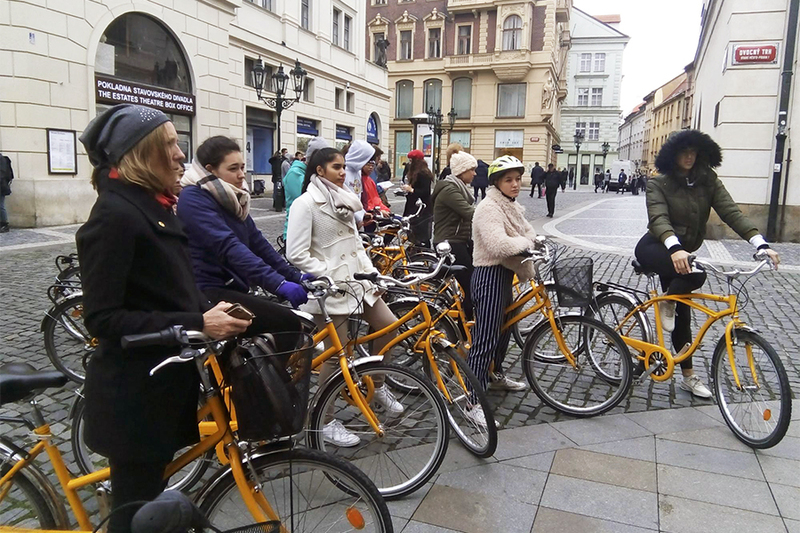 On the last day we went on a bike tour and biked around Prague for two hours. 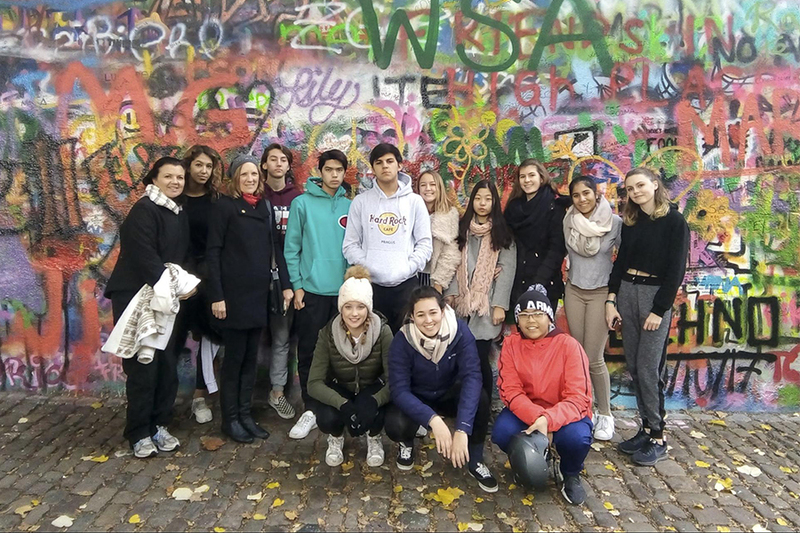 We saw incredible sites, but as a group we all favored the John Lennon wall, which was a protest against the law of banning John Lennon's music in Czechoslovakia. The one challenge we as a group conquered was our first opera, which was three hours long, all sung in French, and late at night on the first day we arrived (the same day in which we left school at 5:30 AM). We all loved it even though we could not understand any of the performance. There were some famous musical pieces in it that we all recognized instantly and made the rest of the audience aware that we were familiar with that song. Our group was especially unpredictable, as we all were outstandingly different from each other, each member with different backgrounds and music favorites. I was given the chance to interact with students I never have seen or would have known in my normal TASIS life. Prague gave our group a new appreciation for music, and the trip included a look into the history of Prague and how music displayed light in dark times. Music was greatly appreciated by the people of Czechoslovakia. Composers such as Anton Dvorak and Bedrich Smetana were heroes to the Czech people—as was Mozart, who introduced his new music to the Czech people. We were given the chance not only to encounter the Czech culture but to experience the great appreciation for music the Czech people pride themselves on. I feel honored to have seen what Prague has to offer for the week we stayed, and I now believe that understanding the importance of music in the Czech culture is vital for experiencing both music and Prague. A BIG thank you to our teachers: Ms. Forrest and Ms. Schumacher. If it were not for these strong and musically cultured ladies, we would have never gotten the chance to see and appreciate music like we did on this trip. All our gratitude and love. For more details about the kinds of things students do on Fall Academic Travel trips, check out this recap from last November.